Create interactive documents with these easy-to-follow video tutorials, lesson files, and reference guide. Designers today are increasingly called upon to create materials in a wide variety of media, or materials that can be delivered via multiple media, not simply for print or for Web alone. In Creative Suite 5, Adobe has addressed that need by making InDesign a powerful cross-media design tool, so designers can use the main tools that they're familiar with to create documents that not only look beautiful in print, but also provide all the interactivity customers expect when viewed online. 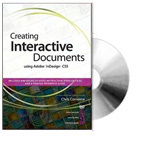 When creating interactive documents in InDesign CS5, it is possible to optimize your interactivity for both PDF and SWF export, or you can focus your efforts on the more advanced animation and interactivity capabilities of the SFW format. In the two documents below, the interactivity chosen in the InDesign documents matches the capabilities of both PDF and SWF, allowing us to publish similar user experiences across both document formats. In the document below, the animation and interactivity have been set in InDesign to create a very rich user experiences that can be viewed in Adobe Flash Player.